en el seminario de Álgebra del segundo piso de la Facultat de Matemàtiques. El profesor Jean-Éric Pin, director de investigaciones del LIAFA (CRNS-Université Paris Diderot, Paris 7) visitará el Departament d’Àlgebra de la Universitat de València entre el 20 y el 26 de octubre de 2015. Es experto en teoría de autómatas y de lenguajes formales, así como en semigrupos y topología profinita. En la actualidad es miembro de nuestro equipo de investigación. 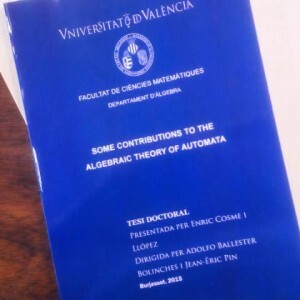 «Some contributions to the algebraic theory of automata». Esteu convidats a assistir a aquest acte. Actualització 16/10/2015: La defensa es durà a terme a la sala de graus de la Facultat de Química i no a la de Farmàcia, com inicialment estava previst. 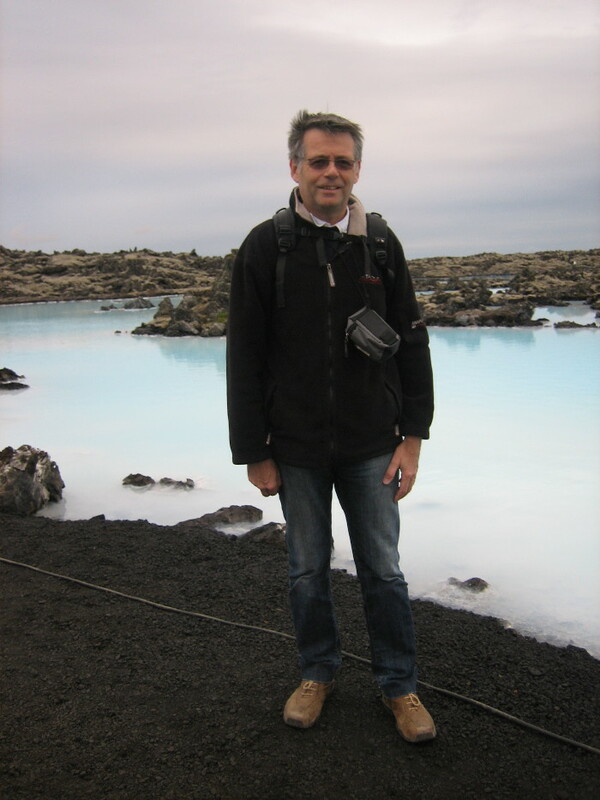 Paper “Languages associated with saturated formations of groups” published in Forum Math. In a previous paper, the authors have shown that Eilenberg’s variety theorem can be extended to more general structures, called formations. In this paper, we give a general method to describe the languages corresponding to saturated formations of groups, which are widely studied in group theory. We recover in this way a number of known results about the languages corresponding to the classes of nilpotent groups, soluble groups and supersoluble groups. Our method also applies to new examples, like the class of groups having a Sylow tower. Paper “On fixed points of the lower set operator” published in Internat. J. Algebra Comput. Paper “Formations of finite monoids and formal languages: Eilenberg’s variety theorem revisited” published in Forum Math. We present an extension of Eilenberg’s variety theorem, a well-known result connecting algebra to formal languages. We prove that there is a bijective correspondence between formations of finite monoids and certain classes of languages, the formations of languages. Our result permits to treat classes of finite monoids which are not necessarily closed under taking submonoids, contrary to the original theory. We also prove a similar result for ordered monoids. Paper “A noncommutative extension of Mahler’s theorem on interpolation series” published in European J. Combin. In this paper, we prove an extension of Mahler’s theorem on interpolation series, a celebrated result of p-adic analysis. Mahler’s original result states that a function from N to Z is uniformly continuous for the p-adic metric dp if and only if it can be uniformly approximated by polynomial functions. We prove the same result for functions from a free monoid A∗ to Z, where dp is replaced by the pro-p metric, the profinite metric on A∗ defined by p-groups. El profesor Jean-Éric Pin, director de investigaciones del LIAFA (CRNS-Université Paris Diderot, Paris 7) visitará el Departament d’Àlgebra de la Universitat de València entre el 4 y el 11 de noviembre de 2013. Es experto en teoría de autómatas y de lenguajes formales, así como en semigrupos y topología profinita. Sus contribuciones en estas áreas han sido muy destacadas. 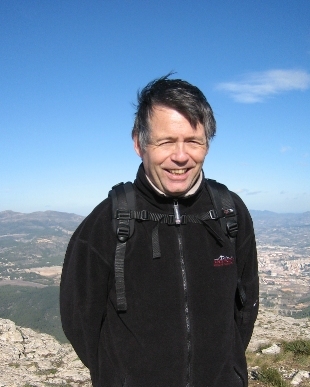 Es autor de varios libros de investigación («Variétés de langages formels», «Semigroups, Algorithms, Automata and Languages», «Infinite words», entre otros) y del programa «Semigroupe» de cálculo con semigrupos. También es autor de 145 artículos de investigación en revistas científicas y actas de congresos. Ha dirigido 22 tesis doctorales y ha sido investigador principal de diversos proyectos internacionales de investigación. En la actualidad es miembro de nuestro equipo de investigación.